Paddu(Kannada), appe(Konkani), ponganalu (Telugu), paniyaram(Tamil), unniyappam(Malayalam), is one very popular dish in South India. To make this we require a special paddu tava (Appe Kayli), which looks like following. Usually we get two kinds of tavas, one of black colour(of cast iron) and other silver color(I guess it is aluminium). In silver one the batter does not stick to tava, so preferably use that. These days we get non stick paddu tava, which looks like following. 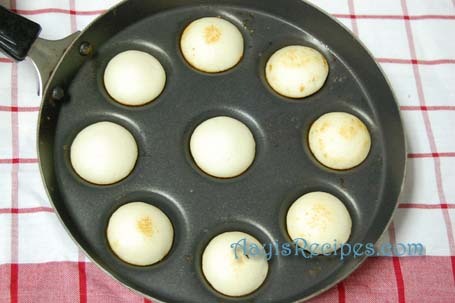 If using cast iron tava, grease it with oil in the night and use it for making paddu next day. By doing this, paddu does not stick to tava. Click here for sugarcane juice appe. hi shilpa,are u a kanndiga,just curious to know,bec even we say avalakki.i just hunt for friends who are kanndigas,i feel special . Roopa, I am a Konkani who has grown up in Karnataka. Have studied in Kannada medium school. All my friends were Kannadigas :). Sree i love the content of this particular site, its simplicity makes it all the more comfortable and very warm for some reason. apaprt from eating this as breakfast you can make a tasty snacks for younsters by adding a little ginger, fine chopped onions and fine chopped chillies to it. Does this dish has any other name? I want to buy the pan to make this dish, what should I ask for? These are called Ponganalu in Telugu, Paddu in Kannada. I donno any other language name. Click here for the pan. I am a regular visitor of aayisrecipes.com, and am so glad to have found a collection of Konkani recipes that my mom was not able to pass on to me before she passed away. Appe were my favourite Sunday morning breakfast, and I haven’t had them in about 8 years!! I am looking forward to trying them soon. The link you had inserted into your comment does not work anymore (not surprising, as it is dated over 6 years ago!). Can you please tell me what the pan was called on the website? I live in the UK and found some puff pancake pans, were you referring to these? Thanks a lot for all the effort you put into this website! THANX FOR QUICK RESPONSE SHILPA! Your aayisrecipe site is wonderful .I am thsankful to you for giving such delicious recipes . Could you send me a recipe for sweet appes as I love to have sweets . Hi ! Your aayisrecipe site is wonderful and a real tribute to your Aayi ! I have learnt a number of recipes form your posts. I want to try them out whenever i get a chance. Anyway one request to tou could send me a recipe for sweet appes ? Vipul, Thanks for your kind words. I will post sweet appe soon. I tried your Eggless Date cake with homemade butter as we don’tget good quality vegetable oil in India. It turned out well.Lots of thanks for such easy delicious recipe. I have not yet got your response to my request for the recipe of sweet Appe. I love this dish. I add some onions, tomato(chopped),kotmir. It will be very delicious. I am also a kannadiga and don’t have any friends here. would like to be ur friend. Shilpa: Any poha can be used. To the above batter can add sugar and cardomom powder and can make a sweet dish. am also kannadiga .. i like this site.. can anybody tell me eggless plum cacke as i dont like choco flavors.. I like this very much…really nice….i use to prepare this atleast weekly once. You can make in normal pan. I don’t think it will be so nice though. When you make in this pan, they get heat from all sides and get crispy. In marathi it is called Appe,Bonda or Gundpangale. I love it. Idlis are steamed. paddu is made in the special paddu pan, it gets a crispy outer layer. Hi there, thanks a lot for sharing this recipe. I have been wanting to make this for a long time now, but unfortunately I dont have the paddu pan. I only have a cupcake pan. the shape will certainly defer, but I wanted to know if this can be done in the oven, I knw it sounds crazy but let me know Pls if its an option. 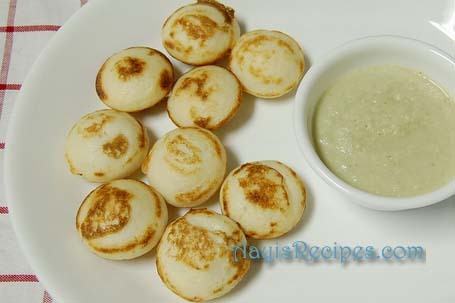 Planning to make these yummy appe for breakfast. So just wanted to know what kind of rice i should i use here… will sona masoor do or should i be using the idli rice only?????? I have tried this with both sona masoor and idli/dosa rice. Both come out really well. So use any kind you have. your receipes are so wonderful and very easy to understand it is simply great. can u please post me receipe of mix dal appe plz….. I can say I am a good cook now. Tried appe today. Keep posting such recipes. Good Luck.